'The Re-Origin of Species': A well-written, easy-flowing book about how we might bring back long dead animals – AiPT! 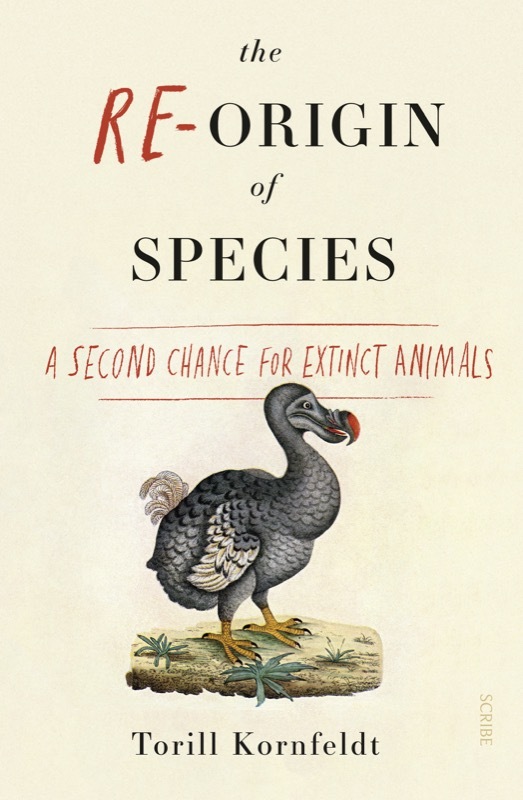 The Re-Origin of Species: A Second Chance for Extinct Animals,by Torill Kornfeldt, is a translated and slightly updated version of a book that was originally published in Swedish in 2016. It’s about various ways that scientists are currently trying to bring back extinct organisms, or in some cases, save organisms that are really, really close to extinction. Kornfeldt traveled all around the globe, talking to many scientists about their research and getting into the nitty-gritty about what they were doing. She asks these scientists how we can bring back a T. rex or a woolly mammoth and, I think more importantly, she probes the question of should we bring these animals back. There are many modern day experiments going on that are trying to bring back long lost plants and animals, and even some not so long lost, and Re-Origin is laid out by going into them (mostly the animals) one-by-one. Some of the most important chapters, though, are the ones at the beginning and the end. In the introductory chapters, Kornfeldt compares these projects as crosses between Frankenstein and Jurassic Park, where the worst is feared to happen but the excitement that it could be done is also there. From the get-go, she tries to run the center line between wariness and excitement. What could go wrong and what are we doing to prevent the “worst case scenario”? The first project delves into trying to bring the woolly mammoth back. To understand everything that can be done to accomplish this, Kornfeldt traveled from the edge of the Siberian tundra to Boston, Massachusetts. It’s less like reading a college text book and more like reading about a famous explorer digging into cultures not seen since the dawn of time. It’s like Indiana Jones light, for the scientist. Kornfeldt breaks down the science of the mammoth project into understandable chunks, describing CRISPR — a fairly recently developed process for editing genes — in ways the general public would likely understand, without going too deep into the science of it. She only gives enough to propel the narrative forward, which could be good or bad. If you know nothing about the science, this writing style gets you enough to understand, but not enough to overwhelm. If you already know about these processes, it may feel a little like she’s talking down to you. Re-Origin continues with various animals such as the northern white rhino, the American chestnut tree, giant bulls known as aurochs, and a few others. But generally, these sections are all variations on the same theme; different methods for bringing back the dead. The most fascinating thing about the book might be all the various methods that are being used to bring these animals back, but more importantly, what is being done to save the ones we currently have — like the cell bank, which preserves DNA from endangered or even extinct animals, in the hopes that one day something could be done to revive them. Re-Origin frequently jumps into and out of the ethics of what these scientists are doing, with a particularly good example being the passenger pigeon. Kornfeldt makes this bird sound like one of the worst plagues that ever inhabited the United States, and that we’re much better for having them gone. There were massive flocks destroying everything in their path, but then there’s a guy wanting to de-extinct them, like this is a good idea. Based on his explanation of what passenger pigeons do for the environment, his argument is a little compelling, although I can see a lot of people disagreeing with him, should he ever succeed. The process bringing these animals back remains a blind spot in the public eye, though. With the woolly mammoth and the passenger pigeon, what many scientists are trying to do is alter the DNA of currently living animals so that they’ll resemble their long lost cousins. They’re not able to clone the animals. At best, they’re making, for lack of a better word, monsters. There is no way in which a lost species can really be brought back to life. The nearest thing we can manage is a substitute. As a paleontologist myself, who grew up a dinosaur fanboy, the “most important” chapter for me would probably be the one in which Kornfeldt talks with America’s “darling” paleontologist, Jack Horner. I’ve heard about his attempts to resurrect a Tyrannosaurus rex through manipulating the genome of a chicken many times over, and personally, I feel it’s pretty stupid and pointless. Not only does the actual process of evolution make it near impossible, but there are far better resources that the scientific community could be focusing on. Kornfeldt has some thoughts of her own in Re-Origin, and you get the feeling of incredulity at many points. If you’re a scientist, you’re skeptical by nature, and I feel she expresses that perfectly. Kornfeldt presents a “prove me wrong” attitude, which is exactly what is needed in this instance — looking at the good and the bad of each side, carefully presenting her own opinion occasionally, but really letting the researcher speak for the research themselves. Sometimes they make a good argument for it and other times not so much, but at least it’s them giving the argument, not the author trying to push her own viewpoint on us. The ease at which the text comes across has to be a combined effort of not just the author but also the translator, who needed to make the Swedish-to-English text make sense and flow. This includes text and interviews originally given in English, translated to Swedish, and now translated back again to English. There are a few instances where the translation felt a bit off, but overall, I would say it was flawless (except for the part I assume was a typo stating that dinosaurs lived 8 million years ago). I was actually quite surprised with how much I really enjoyed reading The Re-Origin of Species. I don’t read much nonfiction, unless it has to do with my own research, and I flew through this book. I couldn’t wait to read more about it and find out about the next experiment.